The Longji Rice Terraces or Dragon's Backbone Rice Terrace Fields is a beautiful natural picture. The linked together rice terraces vary from season to season. In spring, the water is irrigated into the fields and the terraces look like great chains or ribbons hung on the hillsides. When the onset of summer, green waves rush continuously down the mountainside from the heaven. The theme of autumn is the harvest, with the mountainside decorated with the gold of ripened millet. Coming into winter, the whole mountain will be covered with white snow, just like dragons playing with water. This image belongs to the travel and nature stock photo library. This stock photo of Dragon's Backbone Rice Terraces is available for licensing for commercial and editorial uses including websites, blogs, books, magazines, brochures and advertising. Restrictions may apply for images which contain third party copyrighted material or sensitive subjects. Photos of artwork are for editorial use only. 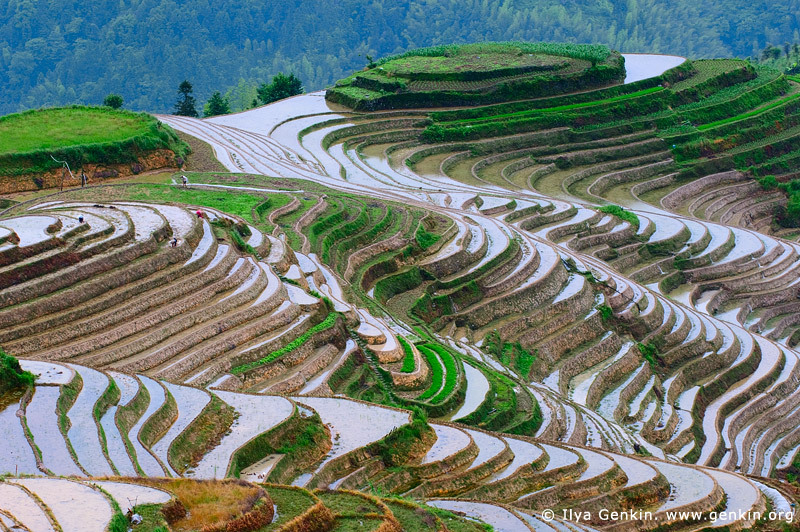 This image id CHINA-LONGSHENG-0008 of Dragon's Backbone Rice Terraces, is copyrighted © by Ilya Genkin. This is not a public domain image.